REVIEW SUMMARY: Lou Anders’s debut novel for young readers is an engaging and fun fantasy adventure. Younger readers will enjoy the novel and find identifiable characters while older readers will enjoy the rich world. PROS: Fluid storytelling, engaging characters and spectacular worldbuilding. CONS: Some dialogue felt forced, some characters a little telegraphed (though that may be because of my age). BOTTOM LINE: Were I the target age for Frostborn, I would have gobbled up this book. At my current age I enjoyed and want more Thrones and Bones. Thrones and Bones is not just the series title for Lou Anders’s debut novel Frostborn, it is also the game with which Karn, one of the novel’s young protagonists, is obsessed. Our other protagonist, the young half-giant Thianna, is an outsider in her land because of her dual heritage. Of course their paths intertwine in Anders’ Norse-inspired fantasy, set in the land of Norrøngard, with undead kings, Afterwalkers (undead warriors), magic horns, wyverns, dragons and dead cities. As is often the case in stories aimed at younger readers with youngish protagonists, the kids just don’t like their situation in life and seek an escape. Karn is set to inherit his father’s large farm, which has been in the family for many, many years. He would rather play Thrones and Bones all day and doesn’t want to be bothered with learning the necessary skills for running a farm. By inserting a game, and making one half of the protagonist duo a gamer, Anders has easily made for a very empathetic and identifiable character to his intended audience. Karn does get some sympathy from his uncle Ori, his father’s twin born just seconds after Karn’s father. Ori tells Karn what he wants to hear and indulges Karn’s gamer leanings. Early on, we learn how good Karn is at the game as he reverses what could have been a failed barter during a trading session. Meanwhile, Thianna is an outsider to many of her own people. Considered scrawny by the full-sized Frost Giants where she lives, she is picked on quite a bit and has her own ‘arch-enemy’ or bully, whom she upends early in the novel. Here also with Thianna we have a character possessing a mysterious heritage; her mother passed away when Thianna was young. A prologue details a woman who fell from the sky into the land of Frost Giants, only to fall in love with one and have a child. Thianna stands out from her people physically; the half-giantess comes across as quite balanced and well-adjusted. She and her father have a great relationship and despite some bickering early on with Karn, the kids make for a great team. I liked how Anders spun typical gender expectations with Karn and Thianna. Thianna is the more physical of the two, while Karn relies more on his brains and craftiness. That isn’t to say Thianna is dumb or Karn is physically unable, because both of those traits can be applied to both characters. Often over the course of the narrative, Thianna saves Karn from dire situations. In other words, Thianna is far from a damsel in distress. While the novel is aimed at younger readers (10 – 14 years old), the novel is enjoyable for all ages, including this soon-to-be 40-year-old. Although such a novel, by necessity, hits some expected story beats, there’s enough surprises as Karn and Thianna’s adventure progresses to keep…shall I say more experienced readers?…of fantasy adventure happily on their toes. Perhaps what I enjoyed most about the novel are the hints at so much more to come, from the hinted-at future for their further adventures to the wonderful world-building which serves as the backdrop of the story. As I often say in novels with great world-building, the world itself is a character and the details are seamlessly delivered through the characters. Such is the case with Frostborn. The world-building does not smother the story nor is it over-indulgent; it enhances the story. I’ve been following the author on social media and listening to podcasts in whch he is featured, and he often spoke about the world-building in this novel and how he fell in love with the Norse region/myth as he was writing this novel. That love comes through quite well. 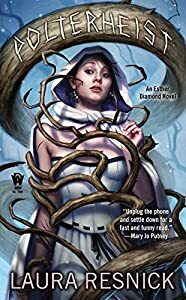 When an author is able to show how much fun he or she had writing and creating a work, it can make for an even more engaging read, like it did here with Frostborn. Many people reading this review will know of the author’s experience on the other side of the publishing desk, which can be seen in his smart approach to the novel. My bagel overlord here at SF Signal recently wrote an article for Kirkus about books that are more than books. Frostborn and the Thrones and Bones series would definitely fit that category. While I cut my fantasy-reading teeth on the works of Margaret Weis & Tracy Hickman’s DragonLance and Darksword, I would have gobbled up this book at that age. Hell, I thoroughly enjoyed it at my current age. I think the best endorsement I can give is that I look forward to reading more of Karn’s and Thianna’s adventures. The publisher and author have gone full bore on this book and series as evidenced by the Thrones and Bones website and the gorgeous design of the book. The cover is a great eye-catcher, each chapter heading has its own icon, and the supplemental material after novel includes a description of how to play the Thrones and Bones game. I wasn’t sure how to review this, and so I just read it, and didn’t review it. I’m glad you stepped up, Rob. Thanks, Paul. I hit that snag sometimes, too being unsure of how to approach a review.